While the real action gets under way at the Irish Open in Co Donegal today, yesterday saw home favourite Rory McIlroy offer some tips to a less naturally gifted bunch of golfers. From pop stars to actors, sporting icons to captains of industry, and even former Taoiseach Enda Kenny, the line-up at the pro-am was a motley crew. Among the amateurs practising their swing in between posing for photos with fans were singers Keith Duffy and Brian McFadden, former Ireland goalkeeper and RTÉ pundit Shay Given and actor James Nesbitt. McIlroy took to the Ballyliffin links course yesterday accompanied by businessmen JP McManus and Dermot Desmond, as well as former champion jockey AP McCoy. 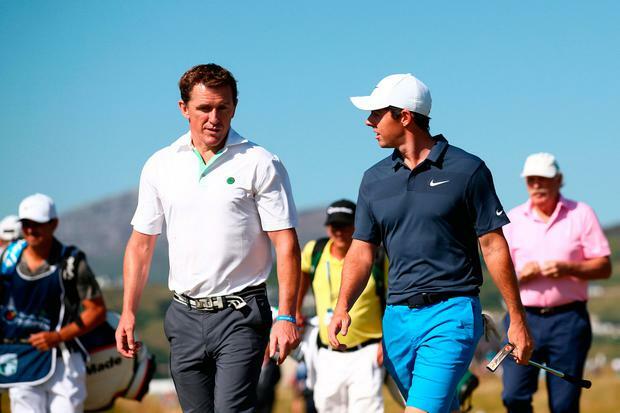 The Dubai Duty Free Irish Open is being hosted by the Rory Foundation and runs until Sunday.